Our mission is to deliver endodontic products and solutions, at a substantially lower cost, which in turn benefits practitioners and patients everywhere. Innovation is the heart of Edge Endo®. We are dedicated to the pursuit of bringing leading-edge products to the industry. This thought and modern business model is revolutionizing endodontic practices across the U.S. and the world. We believe premium technology shouldn’t have to come with a premium price tag. We sell direct to dental professionals, without unnecessary costs, which characterize other endodontic companies and are reflected in inflated prices. Our commitment is to bring you all the quality, at half the cost. 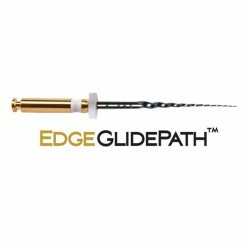 Pack of 4 The EdgeGlidePath heat treated FireWire NiTi file features the legendary flexibility and strength that EdgeEndo is known for, replacing as many as 8 instruments to create a glidepath faster, with far less effort and with a 1mm maximum flute diameter. 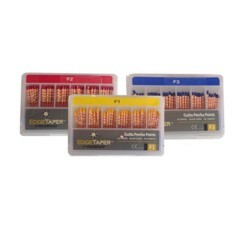 Box of 60 Points Our EdgeTaper gutta percha points compliment F1, F2, F3, F4 and F5 and are standard length 29mm +/-1. 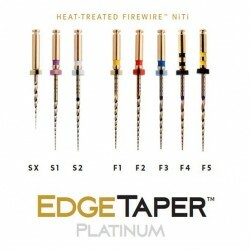 Compatible with EdgeTaperTM and EdgeTaper PlatinumTM as well as ProTaper® and ProTaper Gold®. For use with single cone technique. 60 points per box. Pack of 6 (SX, S1, S2, F1, F2, F3) The EdgeTaper Platinum™ and the EdgeTaper™ are available in 21mm, 25mm, and by the end of 2015, 31mm lengths and are to be used in the same way, using the same technique and ProTaper® and ProTaper Gold®.